hmm, I think you may have misunderstood my comment. I wasn't trying to correct Dr. Racaniello. I was simply pointing out the reason why Agyeman-Badu and I were confused and sent in the question. I love your blog–very interesting and informative, and very balanced presentation. I have to take a bit of an exception to Dr. Dove's comment this week about XMRV, though–“Everybody needs to calm down.” How would you feel if you lost your health and livelihood, had to spend most of your life in bed, were in constant pain, and the only possible treatment is a drug that still hasn't been approved by the FDA after 20 years (Ampligen) and you can't get it? To top it off, the CDC has been saying for years that it's all in our heads in spite of WHO saying otherwise, and they put their money into studies that seem to be designed not to find the real cause and cure. Then they come out with another negative study, which uses neither the same cohort nor methods as a very good, three-location, tightly peer-reviewed study (WPI et al) and claim that, “sorry, people, nothing to see, move along.” And we're supposed to calm down???? That being said, I really appreciate how you are often talking about the latest things going on in the XMRV arena. Your broadcasts seem to be well-designed for medical personnel, scientists and lay people alike. Laurel, I appreciate your point of view, but stand by my comment: everyone needs to calm down. Casting aspersions at the CDC and FDA won't fix anything. The scientists at those agencies are trying to do the right thing. That their findings do not endorse the conclusions you'd prefer doesn't mean they're up to mischief. Science doesn't always tell us what we want to hear. I also take exception to your casual dismissal of the theory that CFS has a strong psychosomatic component. That's not the same as saying it's “all in your head.” As I've said repeatedly on TWiV and elsewhere, a psychiatric disease is as real as any other disease. If it turns out that neurochemistry plays a strong role in CFS, shouldn't we treat that? Regarding the route to market for Ebola drugs, there is a lot of military funding in Biodefense at the moment, the military could be a very large customer for this product if they wished to stockpile a large amount of this in case of an “attack” this coupled with the orphan drug status which should be granted for this drug should allow someone to move forward with this. You are very right about military funding for projects such as the Ebola antiviral. Rich has found some information on this which we'll discuss on TWiV 90. Disease? Serious disease? Very serious disease? Oh, really? Since when? AIDS is a very serious disease; lung cancer is a very serious disease; ALS is a very serious disease; Cirrhosis is a very serious disease. Chronic Fatigue Syndrome is not a very serious disease. In fact, it's most likely thought of as not a disease at all. And I think you know that. See, this is the problem with Columbia University…everyone appears to be in awe of Dr. Oz to the point of actually wanting to sound like him (as you do). The highlight of which seems to be: Throwing in patronizing statements that are, at best an exaggeration, and at worst downright false. But at the same time are statements which will make someone, somewhere, somehow, feel good about something. Continuing to pad Chronic Fatigue Syndrome in this subtle way keeps its ball rolling and ultimately helps no one. For the record, I think Mehmet Oz is a clown. He's on a par with random blog commenters who dismiss large bodies of scientific and clinical evidence out of pure bigotry, ultimately demonstrating nothing but their own ignorance. 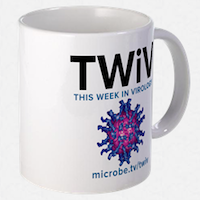 For the record, I'm a subscriber and ongoing listener of TWIV. Fair enough. But please know some of your listeners might just be actual patients living with actual medical issues, like me. I know I share with others that hearing the description of something like Chronic Fatigue Syndrome get over-elevated can be, well, a bit much. Is ignorance your first name or middle name? The CDC says CFS is as disabling as end stage AIDS or a cancer patient undergoing chemotherapy. All you need to do is read. ME/CFS may not be a life threatening disease for the most part, but it is a very serious disease as most patients are disabled and very very sick. Most of us with CFS would rather trade it for AIDS, Cancer or any of the diseases you listed because there is effective treatment for those life threatening diseases which can lead to a productive and functional life. With CFS, there is no treatment so you’re disabled for life!! Read a little and stop being so ignorant.